Japanese bee's honey is squeezed, honey is filtered, and the bamboo basket is usually used. I did not use the bamboo basket, and devised the method of squeezing honey by a filtration once. It would be greatly appreciated when serving as a reference. In general, the bamboo basket is put in a big bowl, Japanese bee's nest is broken in that, and the method of filtering the honey done well is put. Honey collects in the ball dripping when putting it how long. This is filtered with gauze and the cloth. It becomes time and time hangs by two degrees because honey is hung down and it filters it as follows in this method. It makes doing this at a time efficient. The method has put gauze and the straining cloth in the bamboo basket since beginning. It is necessary to wash the bamboo basket, and to clean these methods by the bee because it uses the bamboo basket. I tried the method of not using the bamboo basket as follows. The method of squeezing honey by a filtration once was devised by not using the bamboo basket as shown in this photograph. In a word, it is a method of putting the saucer like the pan under that supporting gauze or the straining cloth in the air. I used metal fittings of X character type used for the method of supporting gauze or the straining cloth in the air when the brown rice was packed into the bag for putting in the bag to enable the bag to become independent. It becomes a rectangle when the wire is put up to both sides in the upper part of X character type, and it sees on. The straining cloth is stopped to this with the clothespin. The nest of the bee that broke is put in this straining cloth. Thus, you can not use the bamboo basket. The upper part where the pot for gardening is supported thinks round-shaped metal fittings to be acceptable instead of metal fittings of X character type. 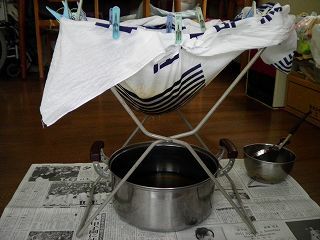 It experimented on the method of using the funnel and the straining cloths as shown in this photograph. This method did not go well though it seemed to be able to strain honey seemingly well. 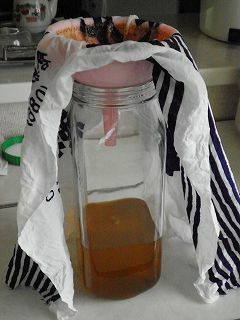 Because the straining cloth sticks to the funnel, honey strains, and the part that passes the cloth decreases. And, the amount from which the strained honey was served was very little, and it did not at all become practical use. Then, the number of washed parts increases though the bamboo basket might only have to be put between the funnel and the straining cloth. The honey that takes side with the ball, the funnel, and the bamboo basket after honey is squeezed is returned to the bee because it is too good when flushing it. Bees beautifully clean it only in putting near the birdhouse. However, after it cleans it as much as possible, it gives it to the bee. Otherwise, the bee might be drowned in honey.